Hi Moores, I think sky is the limit given the white render, so maybe pick a bold colour you have used as an accent in the interior and really make a feature of the entrance?? A golden yellow colour would work well with the style, aspect, existing colours and would be a cheery colour as you enter your home. I’ve a 1930’s house and I chose F&B Cooks Blue, but to be honest I think you could choose any bold colour. It would look fab. 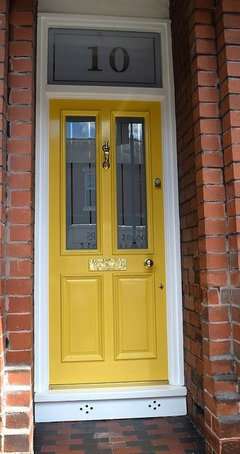 You could go soft green to be safe, but a Houzzer (Sam Potter) recently painted her front door bright yellow and it is gorgeous. 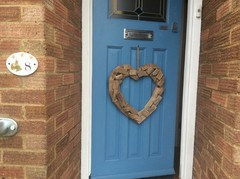 Heres my front door and another in yellow to give you ideas. 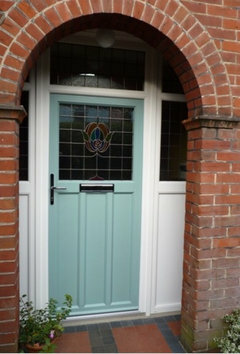 I do like a high gloss white door frame but rqually nice would be country 1930s colours: cream and Cornish blue or sage green. Front door, dark or light? Ideas on improving Front Exterior without a Front Door please? What colour grout for dark navy and green tiles? Old bungalow conversion, new floor plan?